Adin Hill may just be playing himself into a full-time roster spot with the Arizona Coyotes. 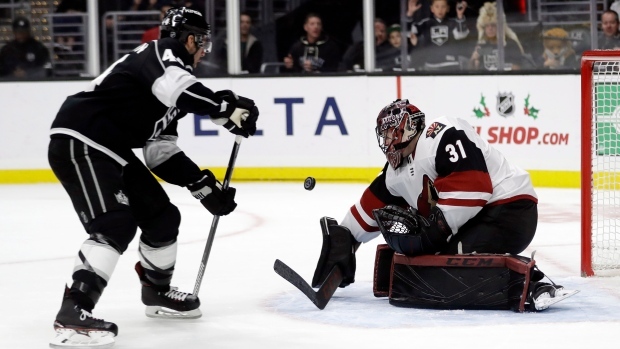 Coyotes general manager John Chayka said Wednesday the 22-year-old, who is 4-0 since making his first start of the season last week, could stay with the team once Antti Raanta and Darcy Kuemper recover from their current injuries. “We’re in a performance-based industry,” Chayka told Arizona Sports 98.7 FM. “We’ve had some injuries and underperformance at times whether it’s been goalies or other players. “To have a young guy step in who has got a good track record, it gets your attention. Credit to him. I think we need all three [goalies]." Hill, 22, has a .977 save percentage in five games since being recalled from the AHL and owns a 0.56 goals-against average with one shutout in three starts. Raanta, the team's starter, has a 5-6 record this season with a .906 save percentage and a 2.88 goals-against average, while Kuemper is 4-5 with a .914 save percentage and a 2.71 GAA. Chayka, however, downplayed the idea that the Coyotes would have a goalie controversy on their hands once Raanta and Kuemper return. Since Raanta, who was injured on Nov. 27, was not place on injured reserve, the Coyotes are carrying three goaltenders with him, Hill and waiver claim Calvin Pickard. Pickard has yet to play since being picked up on Nov. 29 and could to be headed back for waivers when Raanta returns. Raanta, 29, is day-to-day and Hill will make his fourth straight start Thursday against the Washington Capitals.